An idyllic location. A new lifestyle. A holiday home at Lower Hyde will utterly change your pace of life. Instead of long commutes, you have long lazy days at the beach. A hot tub replaces housework. This is your chance to make time for you, to really enjoy life’s simple pleasures. Positioned just outside the seaside town of Shanklin, and its famous sands, Lower Hyde is in the perfect spot for enjoying the Isle of Wight’s finest sights. Enjoy year-round escapes, from quick weekend adventures to month-long retreats to the coast. A new chapter in your life starts here. An action-packed events scene, unspoilt countryside, lively beach towns… the island delivers endless experiences. Discover them from the comfort of your luxury lodge. The pristine sands of Shanklin are nearby, while the beaches at Sandown and Ventnor are a short drive away. Escape from modern life. The quiet countryside and pretty villages of the Isle of Wight are seconds away. 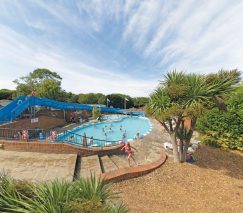 Relax in heated indoor and outdoor pools and make full use of neighbouring Landguard Holiday Park’s facilities. Feel cosy. Your lodge was designed for living with integrated appliances and spacious interiors.